The growth and excitement for Pickleball in this area is truly a wonderful thing to be involved with. The core group in Cary has now grown continually and there is no end in sight. Although we had to give up our daytime playing time in the Bond Park Community Center (due to summer student track out programs), alternative playing venues have emerged. Luis Vazquez, USAPA ambassador for Holly Springs and Garner organized daytime play at the Harrison Grande outdoor court and indoor play at the Cary Community Center. Joe Borrelli initiated daytime outdoor play at the Brier Creek Country Club and evening indoor play at the Brier Creek Community Center. Play at the Brier Creek Community Center has been very, very popular with one of the three courts used for teaching new participants each week. As the result of our previously reported training sessions at Pinehurst their program is off to a running start thanks to the efforts of their Pro Matt Downing, and club members Larry Cox and Rudy VanZanten. In addition to now having a couple dozen regular players they also issued their first invitation for inter-group play . 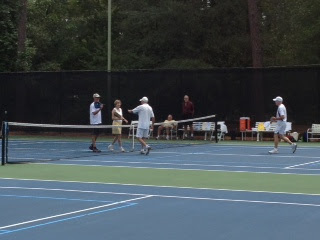 On July 10th ten players from our Cary, NC group travelled to Pinehurst and enjoyed a round-robin teams event which included a fine patio luncheon. It was so successful that the Cary group will now host a similar event this November. It is my belief that Pinehurst, which is internationally known for golf and tennis, has the potential to be a southern Pickleball mecca. 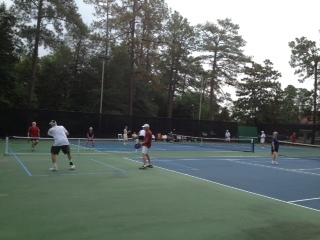 Cary NC town officials have now agreed to meet and discuss converting an existing concrete slab at the White Oak Park venue into 2 Pickleball courts. Also, John Brown, Dir of Parks and Rec, for Apex NC has informed us that our prior efforts there, have resulted in indoor play at the Apex Community Center beginning in September. Indoor play at the Bond Park Community Center will also resume in September and a second tournament is being discussed for October.